We just pub­lished our first NextBrief. Inter­est­ed in the future of tele­vi­sion? This is for you. As The Nextsens­ing Project has grown, our world­wide team of NextSen­sors has been itch­ing to dig deep­er into major areas of poten­tial seis­mic change. To be sure, the con­cept of tele­vi­sion in the 21st cen­tu­ry has cap­ti­vat­ed the atten­tion of peo­ple world­wide. There are two major rea­sons for this. First, peo­ple are dis­sat­is­fied with how tele­vi­sion has evolved. Despite video recorders and net­work stream­ing, TV still seems to be a one-way street. Those who con­trol TV con­tent and those who broad­cast it have (since the mid-20th cen­tu­ry) con­trolled what we watch with­in the con­fines of the tech­nol­o­gy inside our bulky, room-based tele­vi­sion sets. Build­ing on this dis­sat­is­fac­tion, the allure of 21C TV received a jolt when the world took an above-aver­age inter­est in the rumours of a new “Apple TV” that would fun­da­men­tal­ly change the nature of TV watch­ing. (These rumours, mind you, go back sev­er­al years.) Mean­while, every­one waits. But not our NextSen­sor team [link]. I asked nine NextSen­sors to think about the future of tele­vi­sion using the nextsens­ing process. Nora Ander­son, Angela Bren­nan, Dimo Dimov, Steven D’Souza, Anton Elizarov, Pet­ros Kirakosyan, C. Todd Lom­bar­do, Tatiana Sadala and Coree Schmitz accept­ed the chal­lenge. And, frankly, what they came up with was most impres­sive! Their indi­vid­ual thoughts were com­bined and refined, and NEXTBRIEF: A Spe­cial Brief­ing on the Future of Tele­vi­sion [link] has now been pub­lished. Just click the link or the “NextBriefs” tab on the left on our home page. 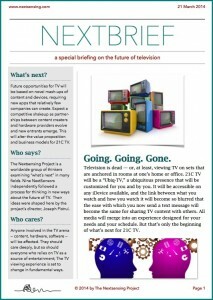 In this new NextBrief, you’ll learn that — in our view — 20th cen­tu­ry tele­vi­sion is dead, that we are at the dawn of “Ubiq-TV” and that Apple may or may not be the one to deliv­er true 21C TV as we envi­sion it. More­over, you’ll learn that the future of the tele­vi­sion indus­try is fac­ing a major shake-up. If you’d like a one-page overview of our first NextBrief, we have added a “News” tab for The Nextsens­ing Project that you can access here [link] or via the relat­ed tab on the left of our home page. I salute the stim­u­lat­ing thoughts sub­mit­ted by the NextSen­sors involved in this report. I’ve mulled this sub­ject a long time, and I learned a great deal from these nine thinkers while we worked on this spe­cial report. Let me invite you to read our NextBrief and share it with oth­ers. As I said ear­li­er, if you’re inter­est­ed in the future of tele­vi­sion (and who isn’t? ), what we have just pub­lished is designed for you.